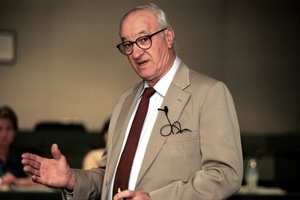 Albert Bandura has long been one of the world’s leading psychologists. He has taught at Stanford University since 1953, where much of his work focuses on social cognitive theory, social learning, and the psychology of personality. Bandura holds sixteen honorary degrees and is a fellow of the American Academy of Arts and Sciences. "We have transcended our biology"
Albert Bandura is often recognized as one of the greatest living psychologists. He sat down with Alexander Görlach to talk about social learning, the origins of morality, and the impact of technological change on human nature.